It’s that time of year. I’m setting the date for the 48 Hour Book Challenge  that special contest that allows you to read and blog guilt-free for as long as you can stand it! I’m avoiding ALA and Father’s Day weekends and going with June 57, 2009, with the check-in day on Monday, June 8th. The weekend is June 57, 2009. Read and blog for any 48-hour period within the Friday-to-Monday-morning window. Start no sooner than 7:00 a.m. on Friday the fifth and end no later than 7:00 a.m. Monday. So, go from 7:00 p.m. Friday to 7:00 p.m. on Sunday... or maybe 7:00 a.m. Saturday to 7:00 a.m. Monday works better for you. But the 48 hours do need to be in a row. Edited to add: But during that 48-hour period you may still have gaps of time in which you can’t read, and that’s fine. In the middle of the three different challenge weekends I’ve had to go to work, attend a ballet recital, and drive for a Girl Scout event. You can certainly work around the other events in your weekend. The books should be about fifth-grade level and up. Adult books are fine, especially if any adult book bloggers want to play. If you are generally a picture book blogger, consider this a good time to get caught up on all those wonderful books you’ve been hearing about. Two graphic novels can be included in the reading. I’m not trying to discriminate, I’m just trying to make sure that the number of books and page counts mean the same thing to everyone. On your blog, state when you are starting the challenge with a specific entry on that day. This makes it easier to track the participants. Write your final summary on Monday, and for one day, we’ll all be on the same page, so to speak. Your final summary needs to clearly include the number of books read, the approximate hours you spent reading/reviewing, and any other comments you want to make on the experience. It needs to be posted no later than noon on Monday, June 8th. Sign up in today’s comments. You’re more than welcome to post the challenge on your site. Point them to today’s post to sign up. On Friday, June 5, I’ll have a starting-line post where you can sign in to say you’re officially starting the challenge. I’ll be looking for donations for prizes for most books read, most hours spent, and most pages read (if it isn’t the same winner as most books read). I will also pick out some “door prizes” randomly from among the participants. Past prizes have included original sketches from Mo Willems and Matthew Holm, signed and sketched books from Adam Rex, loads of signed books, t-shirts from Threadless, artistic blank journals, jewelry, gift cards, and more. Good stuff. If you’d like to contribute to the prizes this year, shoot me an email at motherreader AT gmail DOT com. Edited to add: There's a change to the way prizes are awarded. There will be first, second, and third place winners based on the time spend reading and blogging. Number of books will not be a factor as it discourages bloggers from reading adult books as well as Young Adult books. Specific prizes and rule recap will go up on Thursday, June 4th. Last year I heard comments from participants about tying the contest into to a Greater Good. I like the idea, and have been thinking about how to do that  especially with the online and silent auction for Bridget Zinn taking place this month. Here’s my thought, and feel free to make suggestions for refining it. If they would like to contribute to a cause  Bridget Zinn’s or another  48 Hour Book Challenge Participants can choose a dollar amount to donate per hour or per book. They can also take sponsors from friends and bloggers (and blogger friends). I’m thinking that the donations would be on the honor system, where all parties  the 48HBC readers and the donating supporters  send money directly to the fund. Thoughts? I’ll post the rules again as we get closer, to incorporate suggestions or to answer questions that have come up. So how many books do you think you could read if you devoted a weekend to the task? Ready to find out? Sign up now!!! GAH! I have an ordination, an alumni sing, and the last choir Sunday that weekend. Someday, Pam . . . someday. I want to play! I hardly ever get to read anything more advanced than children's books these days, and I have a growing TBR pile. But I think we'll be moving into our new house that weekend. I'll have to see how the timing works out as it gets closer. Oh, this sounds wonderful! A weekend of reading!! (and blogging). I'm going to try. (I say *try* because with two elderly parents in nursing homes, one age 96 and one age 88, each with health challenges, I've learned not to make commitments...) All being well, I'll be in my reading chair with a stack of books by my side that weekend. I will also post links to this on my blogs -- I know some of my friends will be very interested! I am in!! I think making donations to Bridget Zinn's medical fund is a GREAT idea!! I am thinking about taking pledges for each hour spent reading/blogging books. I will do my best! And I'm wracking my brain for a prize to contribute. I so hope I don't have to work that weekend! (That's not really likely) But I am in! I'll be reading/blogging when I'm not working! This always sneaks up on me. At least it's not on my birthday again this year. I'm in. Most likely. I'm in. I won't have any fresh exams to grade on Friday, so my weekend should be wide open. I'm very much signing up! I got SO much accomplished with the 24 hour challenge, I can only imagine what I'll accomplish with this! I'll set up a post to spread the word! Yippee! It's back again. This was such a liberating weekend last year. I could refuse to do all the things I disliked because I was officially "reading" all weekend. I refused to answer phones, deal with email, and all the other tasks that take me away from reading. I embraced reading and writing. I'm off to put it on my blog. I'm defintly in - I have a graduation on the 6th, but I'll just sleep less (and with some great ARCs from BEA the weekend before, it'll be a great opportunity to knock some off the pile). Don't have anything planned! I'm so excited about this! My children will have to be studying for exams that weekend, so the house should be very quiet! I'm in! The Sunday is my husband's b-day, but I am assuming he will be glad to have a quiet day watching baseball while I curl up next to him and read. Sounds like heaven! Definitely going to play along! I'm excited already. I will try to participate. But may have work that weekend. Will know more closer to the date, but it sounds like a lot of fun. I want to try to participate if I can. I hope I can find someone to watch my kids that weekend. I have to find some easy books to read. That for me is the hard part. Ready to read again. Maybe this year I will be able to really throw myself into it. No trips, no graduations...wait what weekend??? Oh my gosh, high school graduation weekend. House full of family and out of towners. Well, I will try. I can't wait!! 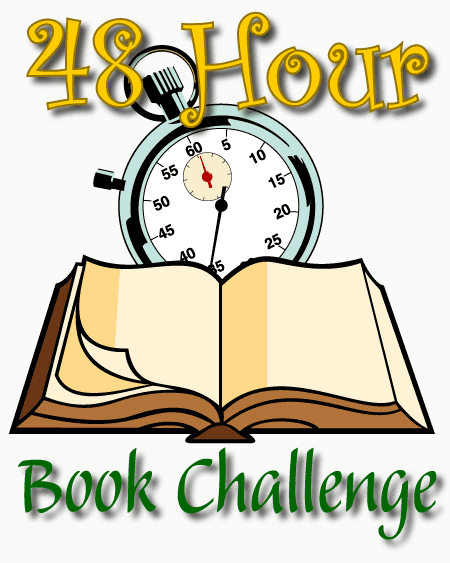 I'm a newbie to the blogging and I last year's posts and hoped you would bring back the 48 Hour Book Challenge. Thank you!! I've got two gigs that weekend plus someone's coming to paint our bedroom (finally!) but I'm determined to be part of the book challenge this year. Count me in. When I get a prize made, I'll send you a note. Ran across this, and I can't imagine anything more fun! (Well, maybe once a year.) I'm in, and will be blogging. What a Great idea! I'm a literacy consultant who works with families and children and I can testify that reading for yourself as an adult, impacts how you view reading with your children and their own independent reading. I read a ton of required reading for professional reasons (including delicious children's books) but also always have an adult book, somewhere outside of those areas, that I'm reading. Just finished Will Roger's bio and I learned so much new info about him. Reading in today's world still have many purposes besides "how to", information, assimilation of data. It can be inspirational and revitalizing, an escape (and we all need that). 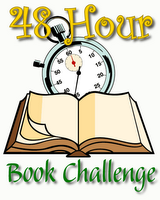 I applaud your efforts and have put the 48 Hour Book Challenge on my calendar! boo! I'm making a cross country trip to see my brother graduate. I'll play on my own the weekend after, though. I'm in. Think I'll start that friday night and read some of the adult books I've been putting off for YA! Oooh! Oooh! This is wonderful! Sign me up. This is a FANTASTIC idea! I am in in in! I couldn't do this last year because I was out of town on a school trip,but this year--I'm in! Count me in for this fun! And hopefully, Bill will be available also, so we'll have 2 bloggers going at the same time again this year. So much fun last year! Really looking forward to repeat fun this year! I'm in again! We'll be leaving for the beach on Sunday so I'll have plenty of time to read there. I just hope I can find a place to blog, but if I can't, oh well, I'M AT THE BEACH! Oh, So excited! I am so in! This is so awesome. What a really good reason to justify taking a weekend off to do nothing but indulge in reading. I plan on participating. Is it too late to sign up? I would love to do it! Count me in! I can't wait to take part. Sounds like a wonderful excuse to read and blog all weekend. Count me in! I'll just be coming back from NYC and have wicked jetlag...so I probably won't function at a very high level! Even though we are still in session at school, I will love to participate and try my best! Thanks! I just put in for that Saturday off, so if all goes well, I'll be in. I'm 99.9997% sure that I'm in. So put me on the list. Definitely in! I'll just be back from BEA with new ARCs and rarin' to read. I'm new to this kidlit blogging thing and I want to play with the big kids. I'm in. I've been trying to find the time to post something on my fledgling blog. This gives me an excuse to stop everything and add some content while doing what I love. Plus the kids will be freshly out of school, so I can get them to participate as well. O! I really want to do this BUT I'm visiting my son in Florida on those exact dates. I LOVE reading, but not that weekend! Can I do it early? Late?? Count me in. The fifth is my last day of school, (I'm a teacher). The ninth I have my final eye surgery. I have told my family that I will need to rest before the surgery and the best way to do that is to sit or lay around and read. They have already seen my stack of book building. My students have been pulling books off of my shelf for me. The funny thing is several of them plan on following my blog starting with the fifth until we return in August. They want to see how many books I read over the summer. My average in years past has been 40 -45 books. That was before eye surgeries. That sounds amazing. I will totally do it! This sounds so fun! I'm in. I'm in, and yay for the Greater Good element! I've done 24 hours...straight...I think I can do 48 with a few breaks. I just heard about this from Liz at yzocaet.blogspot.com. I am so excited! I've already started to put books aside and treated myself to a few new ones. Eeek...I've been so busy that my blog has been sadly neglected as of late, but I'll have to dust it off, because I am definitely planning to do this again this year! I'm going to do this this year. My kids are with their dad that weekend, and I will simply borrow Tim Gunn's advice and "make it work." This is perfect to follow BookExpo on my first full free weekend in months! Both of us at ReadSpace (http://www.readspace.net) are up for the challenge! Sounds like a great excuse to tell people to go away because I'm reading! Hi I think I heard about this somewhere and I have been sitting on it for a little while now. I read the whole post and I want to join in on this great fun. The only thing I am wondering is that my son is doing a walk a thon at his school to raise funds for a local organization that makes books available to under privillenge kids and I would love to donate my money to that if I can. I am in! This is my first time..I missed the challenge last year but I am super excited!!! I will try and blog about it too closer to the start date! Happy Reading everyone!! I have determined that I can find enough 5th-grade-and-up books to read, and I have that weekend off, so I'm in. I just heard and I am teaching reading 5th grade reading next year, so I have a lot of reading to do. Count me in. Can't wait!! "and I am teaching 5th grade reading next year." I also need a nap. I would like to participate but its hard with 2 kids and and a hubby deployed. I will try to do the best I can. I guess I need to start collecting quick reads. Ok, Ok.... Since this challenge has completely over-filled my feed reader, I guess I better join in the fun (even though I'll be out of town and lugging books along with me)or risk feeling left out. Count me in for the best I can do from Orlando, Florida while visiting family, attending Star Wars weekend at Disney and hoping Shamu doesn't splash my book! Hopefully this time I can actually participate. Hm, do you mind my combining your 48 hour challenge with the 12 hour mystery read-a-thon on the same Sunday? It will be pathetic (I'm thinking I'll get to two books max) but I'm in! I think I'll be free that weekend. How exciting! Could you (or someone) please make a goodreads group for this? I'll be joining the Challenge, can't wait! I'm in. I'll be traveling, so don't expect great things from me, but I'll be reading and blogging, which is what happens when you spend most of the day in the airport! I considered and considered...and since I will officially have been in Hawaii one day (for my summer vacation), I think I should kick it off with a 48 hour period of guilt-free blogging! This sounds fun, and I'm excited to join in. I know I'll be jet lagged and not be able to stay up as much as some, but would love a reason to read and blog around the clock! Count me in! i think i'm in! this is my first time for anything like this, but it sounds like a good time! Count me in, please! This will be my first 48 hour book challenge, so I am super excited! Now, the challenge will be not forgetting what weekend it will be! I'm planning to join in the fun! I would like to be a part of this! I'll have to work at least one day that weekend but I'm going to work around my work schedule and do it. Of course, I won't have a shot at winning because of it (needing to sleep so I'm not tired at work plus the hours of actually working). I will totally be doing this. I LOVE read-a-thons!!! In for my second year of the 48 hour book challenge. I am going to try to do this challenge this year. Last year didn't work out so well, too many interruptions. But to paraphrase Scarlett, 2009 is another year! I always look forward to this, and finally this year I have neither work or a dance recital. I'm so in! Just read about challenge this am and can't wait to give it a go! I've had this tab open for weeks, I forgot that I hadn't signed up yet! This is such and amazing idea. I am in! I've always wanted to participate and now that I have an official blog, I'm jumping in! A dear teacher at our school just lost her husband to Alzheimer's Disease, so I'm going to donate $2.00 for every book I read to the Alzheimer's Foundation. I hope others from my staff will join in! This will be my first time participating in the 48hr Challenge, but I'm excited! I'm in! This is the perfect weekend after finals event! I'm in. I've wanted to do it for two years now. I've got some things going on that weekend but I'll read as much as I can -- already have a pile of books saved up. I'm in. Cleared my weekend and I can't wait! I'm totally in. I have a line of books that I want to read. Count me in! I've always wanted to do this. I do have a few activities planned this weekend, but I have blocked out time Friday evening and Saturday and Sunday afternoon. Even though I have to work every day this weekend, I'm going to sign up to do this challenge anyway-I'll give me a chance to work on my TBR pile. Okay, I got Saturday off. So I'm in officially. I would love to join! Thank you! This sounds like fun, and like a glorious excuse for reading all weekend. Count me in, please. I'm anna_bird at livejournal. Oh, I've been wanting and wanting to join in the fun. I think I can clear enough time this weekend to do it!! So, count me in! I said earlier I was going to participate. This is me making a commitment by actually giving you my information. I'm conquering my fears and playing with the big kids. I'm in! Starting at 12am on 5th June. I have a whole pile of young adults books waiting to be read. I thought I might be away this weekend, but it turns out I'm not. Hooray! I'm in! We're new and we're in! i really want to do this! i just found out about it from LiyanaLand, so its sort of last minute . . . but i think i'm going to give it a try! i am sort of confused though . . . for time spend blogging, what does that mean exactly? does time tweeting about it count, or no, because thats not really blogging, but it would be really stupid if i just kept on posting really short posts every 5 minutes to show that i'm online. if you can, please email me at trunerdblogger@aol.com with some info? thanks a ton! I'm glad I stumbled upon this. I'd love to participate and will be setting up stuff to track my progress tonight. I've decided (last minute, I admit) to join in :) I'll be starting Friday at 1PM and my first post is here: http://feedyourimagination.blogspot.com/2009/06/im-crazy-or-how-late-nights-end-up-with.html. totally joining in on this, it will definitely motivate me to restart my website blog up again. I hope it's not too late to sign up! I have a big pile of books to read, and an even longer list of them! Turns out I can't this weekend, although I'm really looking forward to reading everyone's reviews. Hopefully next year! Okay, I'm going to do it! I think I will start at 7:00 on Friday. Wow! I am definitely trying it! I can't wait to read as many books as possible! Count me in!!! Flip the Page Book Review! I'm in. Started this morning at 7. Here is my blog post! Starting June 4th at 6:00 p. EST. I sincerely hope this movement will occur again in 2011, I'd love to chip in.